Groundcovers in the past were maintained with herbicides, what now? Groundcovers in the past were maintained with herbicides, so now what? 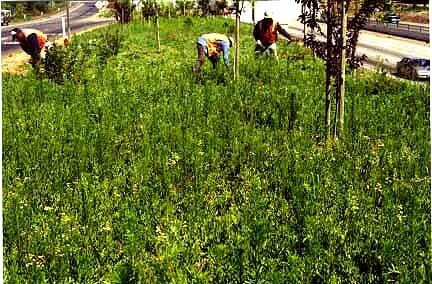 The "ideal" groundcovers used in California in the past were maintained weed-free with herbicides. However, since herbicide use is being lowered in California by this year to 50% and to 80% less by 2012, will the old groundcovers become a maintenance nightmare? Photo shows iceplant being hand-weeded on June 15, 2000 at the interchange of Hwy. 99 and Fresno Street in Fresno, when the shade- temperature was 105°F+. According to the workers, this hand-weeding has to be done twice a month through the spring and summer. 1. Are we going to keep hand weeding the old stuff? How could small-scale trials of local natives be set up? 2. Could test plots of local native plants be made part of the mitigation for new construction? 3. Are there other opportunities during the preconstruction phase to do test plots with local native plants?